Revisit the imperial monarchy of historic Russia and the reign of the tsar. This game portrays all of the elegance and opulence of the lifestyle of the famed Romanov tsar, Nicholas and his wife Alexandria and can deliver a little of the same to you with a jackpot of 10,000 coins. In this 5 reel, 25 payline video slot, the betting ranges starts with coin sizes from $ .01 up to $.50 and you can wager up to 20 coins per line with a top bet of 500 coins. With extra features such as a wild symbol, a scatter, free spins and multipliers. 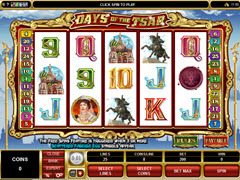 A cloudy blue sky with the silhouette of a St. Petersburg cityscape forms the background of this game and the reels are framed in an ornate gilded edging with the formality of historic royalty. The symbols seem to reflect the story of the last Russian monarchy with a statue of Nicholas mounted on a horse, an official royal seal, a Russian cathedral, Alexandria – the tsarina, and the card symbols from 9 to ace. The constant background noise is a subtle whir of the reels that erupts into cheers from the crowd when the tsar appears, a chord from the Russian classical music sounds for wins and scatter. An imperial classical song plays throughout free spins. 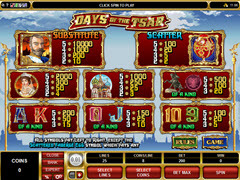 The Tsar serves as the wild symbol and will exchange out for any of the other symbols in the game with the exception of the scatter to assist you in completing winning paylines. Five of a kind of the wild is your ticket to the top payout of 10,000 coins. The ornate Faberge egg is the scatter symbol and will provide you with a multiplier for each occasion that it appears on the reels of 2x, 5x, 20x or 100x relative to occurrences of 2, 3, 4, or 5. Three or more scatters will activate a free spins round which is determined by the number of spins which are revealed on each of the symbols and then added together for the total number of free spins. More free spins can be awarded through active play to extend this bonus round indefinitely. You can always choose to gamble your winnings, taking a small risk for a potential big outcome. By predicting the colour of a card draw in this option, you can double your payout and by correctly guessing the suit of the card, you can multiply your award by 4x. This game serves to remind players that, in earlier centuries, Russia was a wealthy and powerful nation, admired by other European nations. You don’t need to know the full history to enjoy the lavish graphic style of this game, take advantage of the special features and cash in on some great payouts. All in all, the level of action and betting range in this game are mid-level and should thus appeal to almost any player.